A leaky cash pile will make China’s economic transition more difficult. 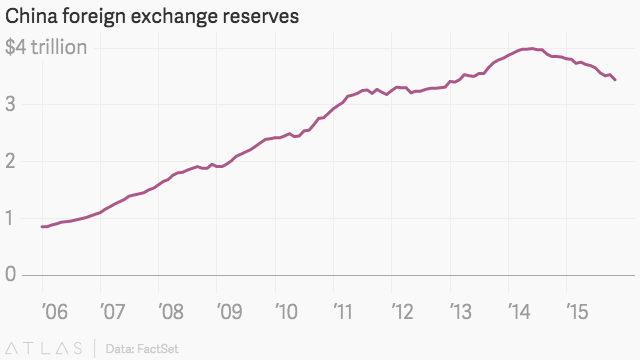 China’s massive pile of foreign exchange reserves is shrinking, to the effect of $87 billion in November. 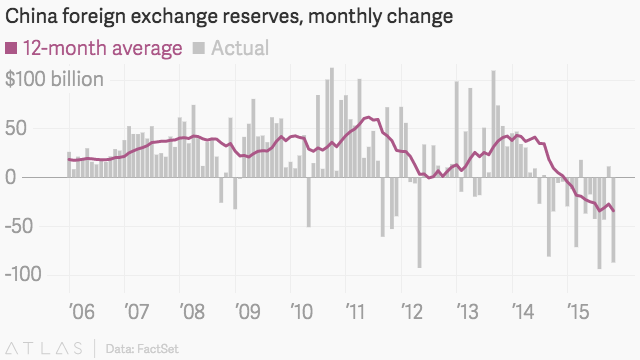 That’s the largest monthly outflow since China devalued the yuan back in August. At $3.4 trillion, the country’s total reserves are now at their lowest level since March 2013 and nearly 14% smaller than when they hit their peak of just under $4 trillion in June 2014. This is bad news for the Chinese yuan, which just secured a place in the International Monetary Fund’s prestigious special drawing rights basket of major currencies alongside the US dollar, British pound, euro, and Japanese yen. It’s fine to have a weakening currency if you’re counting on exports to boost economic growth, like in Japan. But China doesn’t want to rely as heavily on its industrial sector anymore, and nobody has much use for a weak trading currency.